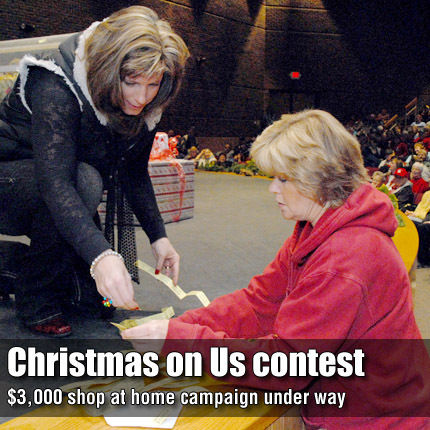 Herald-Chronicle publisher Catherine Faimon and Cindy Harris, on of last year's winners, search through tickets at the 2010 Christmas on Us Grand Prize Drawing at the Osage City School Auditorium, where this year's grand prize drawing will be held Dec. 17. OSAGE CITY — As many as 14 Osage County shoppers will be rewarded for shopping locally over the next three weeks. Thirty-seven businesses are joining The Osage County Herald-Chronicle to sponsor Christmas on Us, an exciting promotion that will award prizes totaling up to $3,000 to people who shop locally at participating businesses. The contest is in its fifth year. Customers of any Christmas on Us sponsor are eligible to receive one ticket for every $10 transaction, up to a $2,500 purchase. The tickets could be worth scrip money, if the ticket number is drawn during one of four weekly drawings, or during the grand prize drawing set for 9 a.m. Saturday, Dec. 17, inside the Osage City High School auditorium. Scrip money can be spent at any business participating in the Christmas on Us promotion. The contest kicked off Thursday, Nov. 17, the day Christmas on Us sponsors were featured in the newspaper. The first drawing for instant $50 prizes was held earlier this week. Winning numbers are printed within certain ads on pages 1B, 2B, 3B and 8B in this edition. New tickets will be drawn each week and will appear in ads on Dec. 1, Dec. 8 and Dec. 15. It will be up to ticket holders to search the ads for their numbers and claim their prize at The Herald-Chronicle office by noon Tuesday of the following week. Christmas on Us will culminate with the grand prize drawing at 9 a.m. Saturday, Dec. 17, at the Osage City High School auditorium, where donuts and coffee will be served by newspaper staff. An estimated 600 people attended the grand prize drawing last year. The grand prize drawing will include drawings for any unclaimed $50 instant prizes, two $250 prizes and two $1,000 grand prizes. Scrip must be given to merchants at time of purchase, and expires March 31, 2012. Approximately 107,000 tickets were given away in last year’s contest, which translates to more than $1,070,000 spent with Christmas on Us sponsors for merchandise and services at participating businesses throughout Osage County. “The contest rewards people for spending their money locally. It also rewards the participating businesses, since the scrip money can only be spent at those businesses who signed on as sponsors,” said Chris Faimon, co-publisher of The Herald-Chronicle. Businesses participating in Christmas on Us this year are: Casey’s General Stores in Burlingame, Carbondale, Lyndon, Overbrook, Osage City and Scranton; Theel Plumbing; Skip’s Thriftway; Swisher Automotive; Gibson True Care Pharmacy; Marilynn’s Restaurant; Dr. Kevin Lenahan & Associates; Carbondale Dollar General; Branine Chevrolet Buick; RJ’s Auction Service; Lyndon Building Materials; Hanna’s Auto Repair; Jim’s Garage; McCoy’s a Radio Shack Dealer; Osage Hardware; Jerry’s Thriftway; Santa Fe Trail Meats; Caffe Thyme; Osage Building Materials; Furniture Loft; Relaxation Station; Rustic Treasures Old Country Store; Buzzard’s Pizza; Carbondale Tire & Auto; Harmon Dental; Lamont Hill; Club Four Corners; Aunt Dee’s BP; Overbrook Family Dentistry; T-N-T Video; D&D Tire Center, Inc.; and Feltner Floors & Furniture.